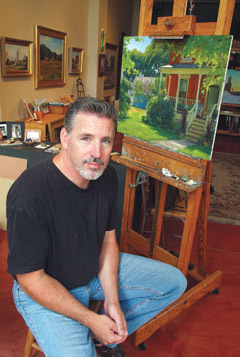 The following interview appeared in the Summer 2008 issue of the California Art Club Newsletter and is published here in its entirety with the permission of the California Art Club, californiaartclub.org. 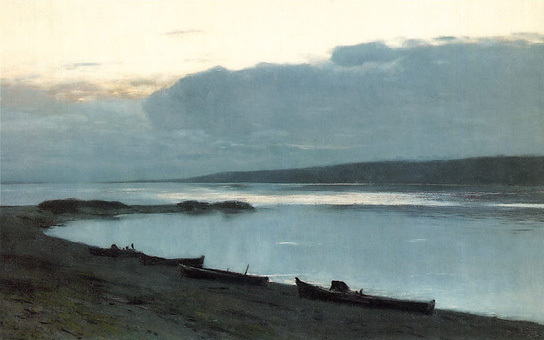 Miriam Nöske (MN): Why did you choose “Evening on the Volga” by Isaak Levitan? Joseph Paquet (JP): When I was a young man I visited an exhibition on Russian painting and iconography at the Smithsonian Arthur M. Sackler Gallery in Washington, D.C., and saw Evening on the Volga by Isaak Levitan. I was immediately struck by its power and lack of forced drama; in fact it was quite the opposite. Levitan depicted nature in an exquisite tonality with a poetic sensibility what he saw, translating nature’s beauty in a pure and authentic way effectively getting my attention with a whisper. MN: What interests you most about this early painting in regards to composition and techniques? Highland Park painter Joe Paquet sits at his desk beside a shaft of midmorning sunshine streaming through the window of his Prince Street studio in St. Paul’s Lowertown. His landscapes hang from the studio’s south wall and the sunlight seems to make them glow. A more studied observation, however, reveals that the light is emanating from the paintings themselves, not the window. A taconite plant reveals the squalid beauty of industrial decay as seen on a winter afternoon. A colorful row of dilapidated houses is offset by the steely skyline of downtown New Orleans. The viridescent leaves of a maple tree frame the front of a brick house and garage in Lowertown.